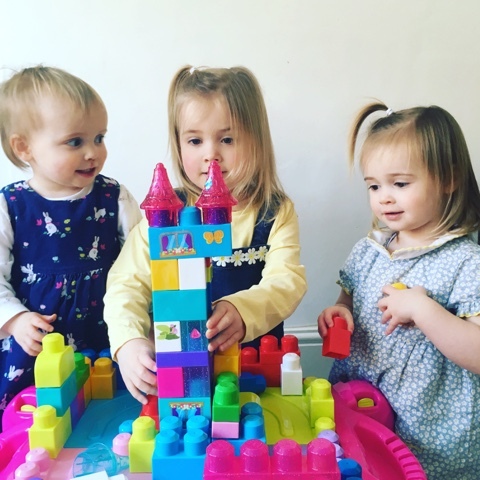 The little ladies absolutely love building things and we have a variety of blocks for them to play with. 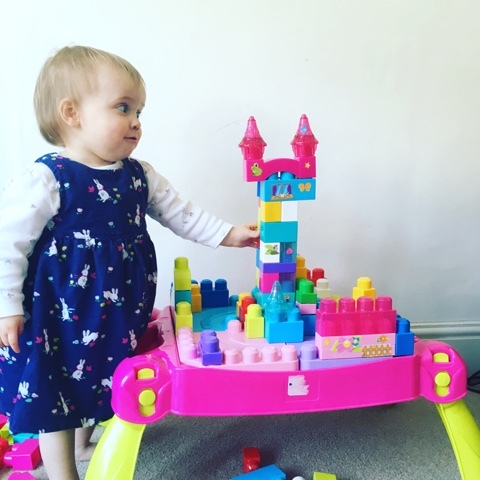 Their Megabloks are a firm favourite as they are something they can all play with together. 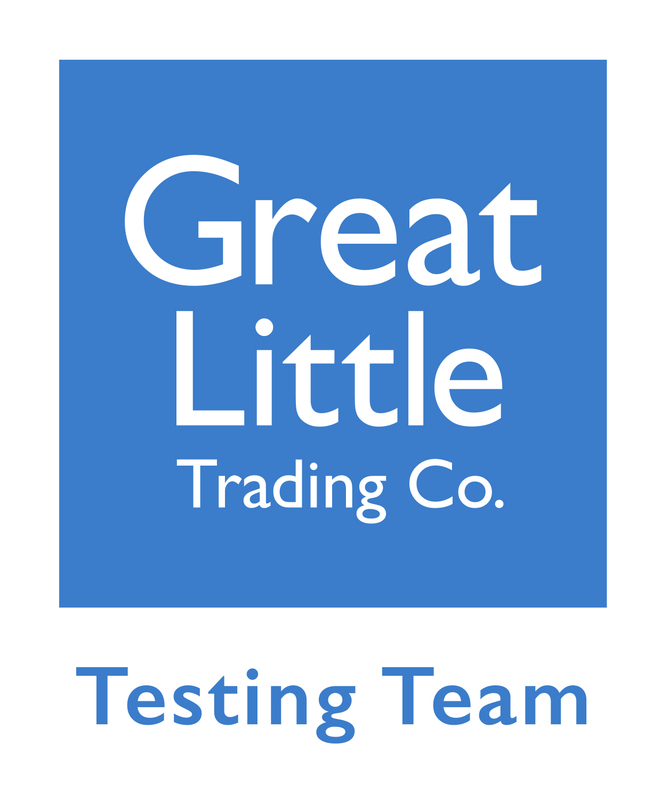 Bright, colourful, easy to hold and join together they really are perfect for 1 - 5 year olds. They are designed by Fisher Price, a brand we all know and love and one I grew up playing with myself. 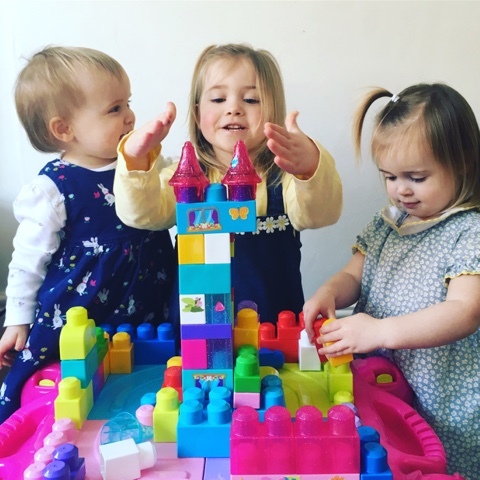 I recently challenged the girls to build something together using their Megabloks and here's what they came up with... 'Rapunzel's Tower'! It was really interesting to watch them play together as their imaginations got to work and the tower building began. They really worked together and communicated about which bits should go where, Miss Tibs was tasked with building the outside wall while Miss Boo concentrated on the tower and Miss Dot just put blocks on and off wherever she fancied! This kind of activity really holds their focus and results in a lengthy play session. I think they love that it's different each time they play with it, that what they build is up to them and they can be as creative as they like. I loved how proud they were of their final result, they genuinely felt such a huge sense of achievement and satisfaction. They had such fun and were learning all kinds of things along the way which is a big win for me. 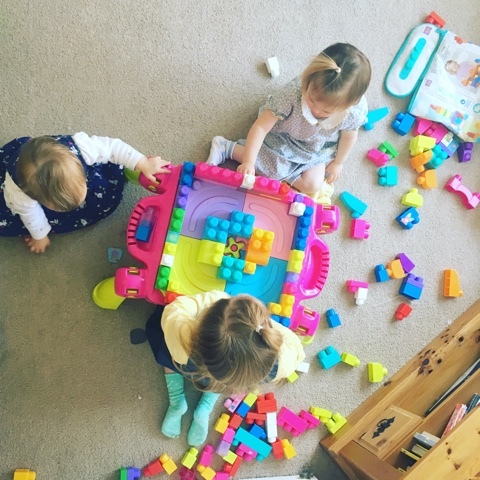 The girls play with their Megablox together and alongside each other in different ways, they really are a toy that grows with your child. 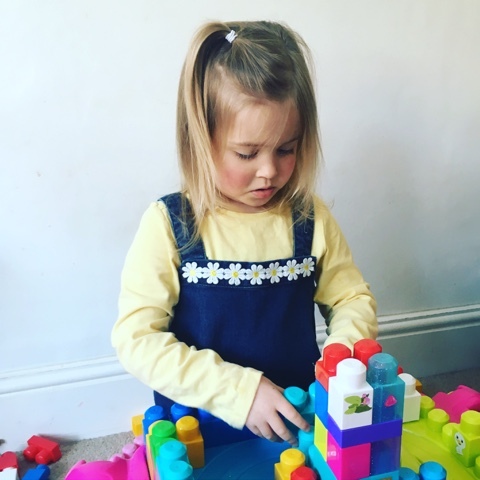 At 19 months, Miss Dot loves building up the blocks then knocking them down, she can easily fix them together and take them apart and she definitely shows preference to which colours she likes too. I love that it develops her fine motor skills and that it's something she can join in with and learn from her big sisters. 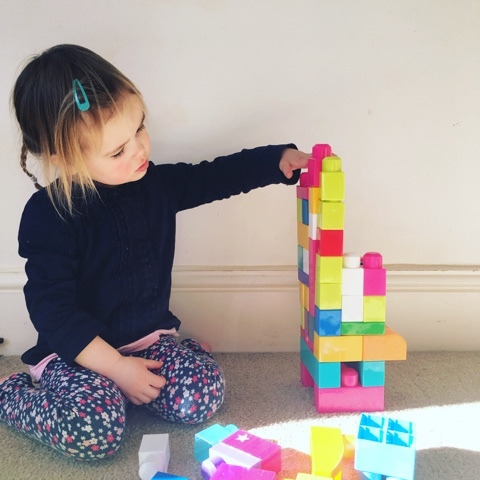 At 3, Miss Tibs loves to see how tall she can build a tower. It is so interesting watching her figure out how to get the tower to balance and where to put the blocks so that they fit and she can keep building upwards. She concentrates so hard on the task in hand and really enjoys it when I sit and build with her making it a really great activity to do together. At 5, Miss Boo's imagination is running wild and nearly everything she does has a story behind it. She'll build shops and castles and gardens and towns and then play with little characters in the world she has created. She teaches her little sisters and includes them in her games which is wonderful. Miss Boo ensuring her walls are structurally sound! The 'Build & Learn' Table has been great for giving them a focal point for their activity and is something they can get out and use when they like. They can store their Megabloks in the table meaning it's self contained and easy to pack away. The legs of the table also fold down flat so that it can be stored easily. It comes with some blocks to get you started and you can add to it in with several Megabloks sets. We love the 'Big Building Bag' which has 60 colourful blocks in of different shapes colours and sizes. 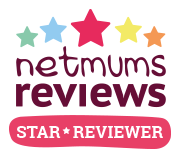 This Easter Megabloks are running a competition with Netmums for you to win one of 5 Megabloks sets. Their new campaign #Chocablox is all about playing with Megablox this Easter. I don't know about you but we were inundated with chocolate last year and something like this would make a fab alternative Easter gift for your little ones. All you have to do is share a picture of your little ones playing with their Megabloks HERE by 16th April 2017. Good Luck! And the 'i'm doing my best' not to screw this up mamas. And the ones giving hugs. And the mamas of babes who grew their wings too soon. And the dads being mama too. And the somewhere in between mamas. And the fairy god mamas elected to support us. And all that is you. I don't quite know where to start with this month's Siblings Project post... the girls relationships have been rather 'interesting' lately. 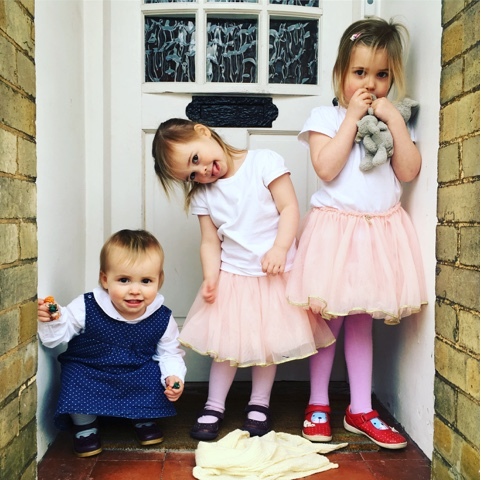 My siblings shots this month kind of capture the fact that they are a little bit out of sync, being a little bit cheeky and if I'm being entirely honest (which I always endeavour to be here) testing my parenting skills! This month instead of seeing 3 sisters in the frame, I see 3 individuals, which of course they are but there is normally more unity between them than there has been over the last few weeks. I feel like I am a constant referee at the moment as there's an awful lot of bickering and squabbling going on. They really seem to be testing the boundaries with each other, whether its taking a toy someone else is playing with, eating something off each others plate, running away with something treasured by another sibling and the odd yank of the hair, tongues being stuck out and voices raised. It's been incredibly draining and quite frankly exhausting sorting out all these tiny disagreements which of course to them feel huge. I'm trying to pull some positives from this stage and have consoled myself in the fact that while they might be finding each other an annoyance at times, they are actually helping each other learn so many life lessons and skills which will be super valuable. They are learning about emotions, learning to consider others, how to share and how difficult that can be, they are learning to respect choice and difference, they are learning that we might not always like what others do or say and so much more. 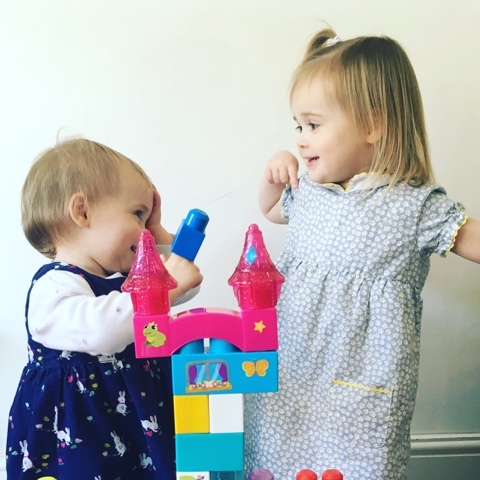 Whilst every little intervention is frustrating and exhausting for us as parents it gives us opportunities to give the girls tools to solve these problems between themselves, to negotiate with one another and to remind them to be kind and gentle to one another. 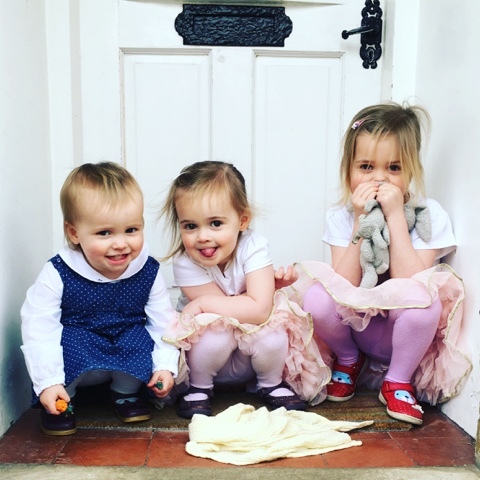 It's easy for us to forget that they are actually only 5, 3 and 1 and that they are very much still learning these skills and that our role as parents is to teach them and guide them through through each altercation. Being all girls and very close in age it's also really easy to group them together as 'the girls' and I think it's really important for me to remember that they are all individuals developing and finding out who they are with very different personalities and strengths and weaknesses - there are bound to be clashes. There's probably also a little bit of sibling rivalry going on too and they seem to be vying for my attention and going about it any which way they can. 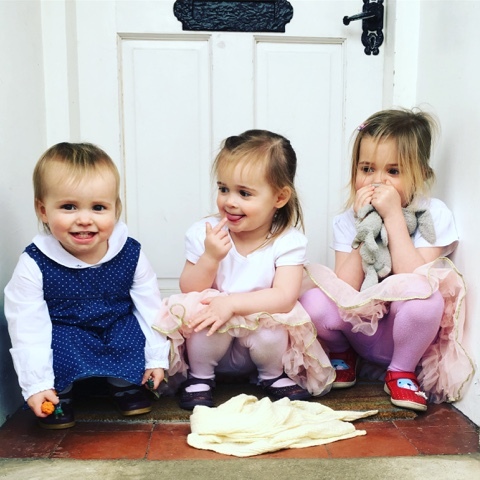 I love being a mum of 3 but it is incredibly hard to give each of them my time and I often feel guilty that they have to 'wait a minute' more often than I'd like while I sort a sibling out. With 3 children there are also several combinations of 'fallings out' which is probably why it feels like it's pretty constant. There are plenty of lovely moments between them too which are easy to miss when you feel like you have spent most of the day solving problems. 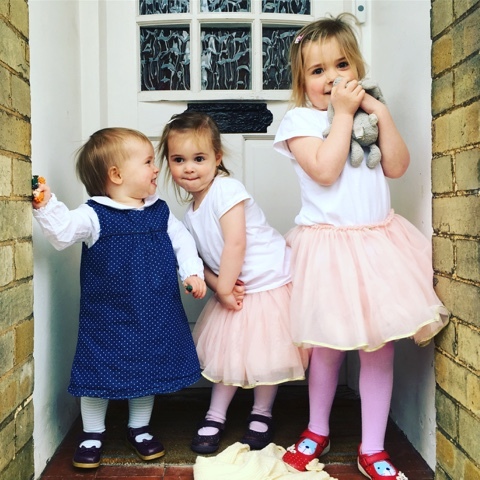 This morning for example Miss Tib's let Miss Boo have the last packet of the variety pack cereal, Miss Dot climbed up on the sofa and cuddled up to her sisters and gave them both a kiss and Miss Boo let Miss Tibs choose the after school TV programme. So as much as they are battling they are also making peace and although I'm pulling my hair out a bit they really do love each other very much, as long as someone hasn't got a better kinder egg toy than them that is! These are my go to quick bake for when we are having friends over for a cup of tea, when we fancy a sweet treat or for sending in the post to a friend who needs a little pick me up as they travel well! 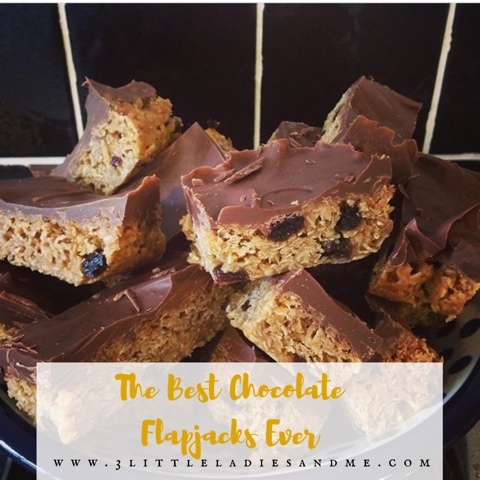 They are so yummy, so easy and pretty fool proof which I think makes this best chocolate flapjack recipe ever. Give it a go and see for yourself, everything you need and instructions are below, I will apologise in advance as you'll never be able to eat just one! - 400g milk chocolate for the top. - melt the chocolate in a bowl and then spread on top of your flapjack and leave to cool and reset. - Once set simply chop into chunks and serve. Lately, despite my very best efforts, i've felt like I haven't been doing anything particularly well. 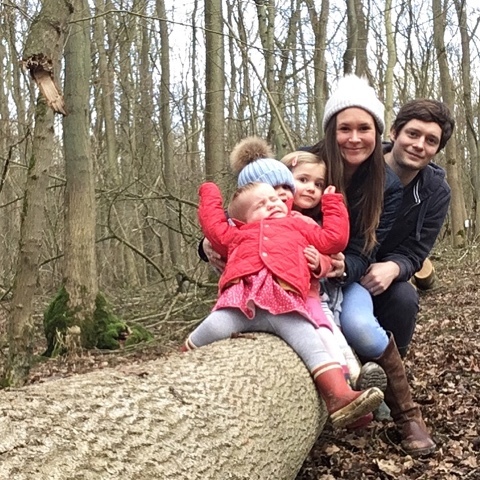 Being a mum, wife, friend, daughter, sister and an employee has left me feeling pulled in rather a lot of directions. Trying to give each of these things my all has left me feeling deflated, frustrated and most of all exhausted. It's just not attainable to have and do it all, all of the time, which is why i've decided that i'm letting some things slide and i'm ok with that. My mistake has been trying to do everything well so i'm trying to live by the 80/20 theory which basically endorses letting things slide and accepting there will be some things each week that just won't have 100% of my focus, effort or attention. By focusing on doing 80% of things well I'm allowing myself to let 20% of things slide each week, whether that be the housework, not worrying that I haven't replied to all messages on my phone from friends and family, or spent any time with my husband. One week I may barely speak to my husband as we sit on the sofa at either end, scrolling through our phones too exhausted to actually talk to each other, or barely see each other because of work or other commitments. 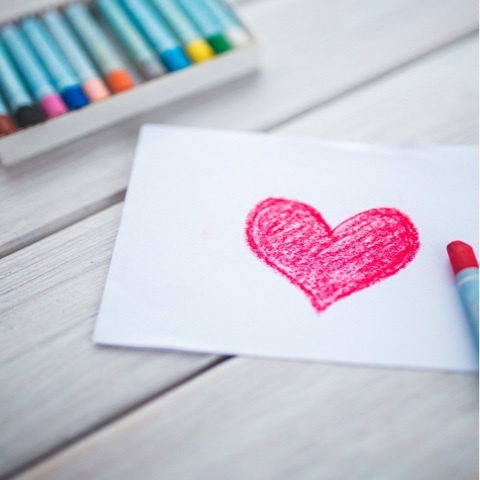 The next week it's date night and a lie in while the children stay overnight with grandparents, or a takeaway snuggled up watching a film or a family weekend where we can step back and feel super proud together of our lovely children. I might go for weeks without seeing or speaking to my friends, meaning to get in touch and see how they are, then the next week we'll have coffee or dinner or a marathon video call and all is well in the world again. I might have a week where I forget to put water bottle in my daughters book bag, or we're too tired to do her reading and they watch far too much tv, but the next week we're on it, nothing is forgotten and we go off out adventuring together. I might have a week when I do nothing for myself and am rushed off my feet and others where I take the time to run myself a bath, go to yoga or treat myself to a bit of pampering even if it's just painting my own nails. There are where my house looks like it has been burgled, with washing piled up and an empty fridge because I haven't had chance to do the online shop and the thought of going to the actual shop with 3 children fills me with fear. Then other weeks we kind of catch up and it's tidy and calmer, and the washing baskets are almost empty! There are weeks we have beans on toast for tea and then weeks i'm cooking things Nigella would be proud of and baking up a storm. There are weeks where my work doesn't always get the best of me because i'm tired from being up all night with the children but others where i'm on fire with efficiency and I leave at the end of the day with a huge sense of achievement. Anyway you get the picture - basically the theory in summary is 'cut yourself some slack'. There will be weeks when its 80/20, 70/30, 60/40 and even 50/50 and that's ok with me because it all evens out in the end and you never know there might even be the odd week where the stars align and everything feels 100% in order. I've been surprised at how ok i've been with this given the perfectionist in me but it's been so refreshing and has really taken the pressure off. So here's to letting things slide... right now its the pile of dishes in the sink because i'd rather be sitting here writing! We are fashionably late with this post but then that kind of sums up February! Life has felt extremely busy and time has absolutely whizzed by... am I the only one wondering how on earth it's March already? 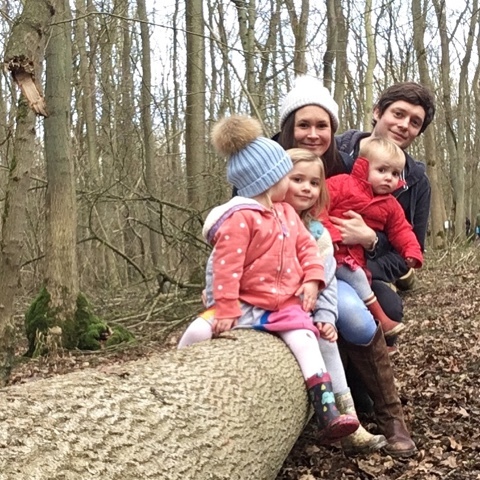 Our favourite thing about February was without a doubt that it was half term which meant for one week at least we could slow down and spend some real quality time together as a family. 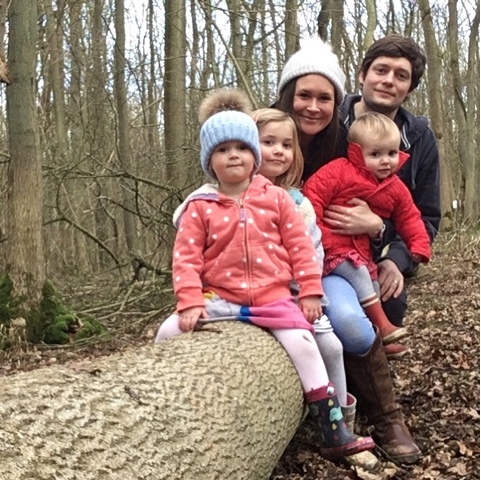 Oli and I both booked some time off work which meant we each got time with all 3 girls and also time together as a family of 5. It was wonderful not having to rush out the door to school and be able to sit and drink tea, snuggle up, watch movies and eat crumpets together. The girls just loved being together as a 3 and kept each other entertained. The time at home also meant we could catch up on life and jobs and relax which was just so lovely. We spent time baking and colouring and walking down to the local park and also squeezed in a couple of trips out to the cinema and to the farm. Our visit to the farm was probably the highlight of the month as the girls were so excited to go as we hadn't been since last summer. Miss Dot loves her farm animal books and was squealing with delight as she spotted the ducks and pigs. They also got to bottle feed some baby lambs and ride a pony, the joy on their faces was just beautiful and standing back and watching Oli and I felt so proud of our little family. February has also bought with it a sense of rhythm and it kind of feels like we are finally settling into our weekly routine. I've been back at work for 3 and a bit months now and it's beginning to feel a bit more normal for everyone. Oli takes care of the girls on Wednesday and Thursdays and they have really found their own way. It feels like there is more of a balance, that we're adjusting and the new dynamic feels good. 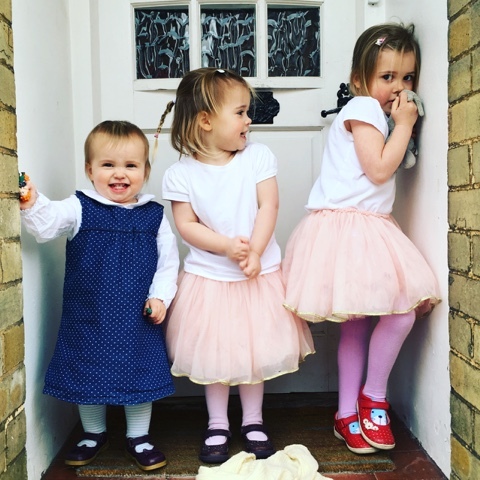 I'm supporting more financially, Oli's supporting more at home and the girls have embraced the change and love both their 'mummy days', 'daddy days' and 'family days' as they have now known.